Every Sword in the RitterSteel® Elite Golden Warrior collection boasts an authentic RitterSteel high carbon steel blade that has been hand forged over hot coals using many of the original techniques passed down through generations of ancient sword-smiths. The beefy tangs run the entire length of the (tsuba) grip to meet the kashira (end cap) making these mighty weapons. Each styled handle (tsuka) and scabbard (saya) are made of wood covered with hand braided rich black cording in the ancient diamond pattern. The resulting pattern of shimmering diamond shaped windows of metallic gold compliment the gleaming solid brass guard and end caps making for a breathtaking appearance. In Japan, the traditional colors of Kuroi and Kin’iro… Black and Gold represent “Power”, “Strength” so it is no small coincidence that our Rittersteel Elite Golden Warrior Swords have been created in triumph of these qualities! 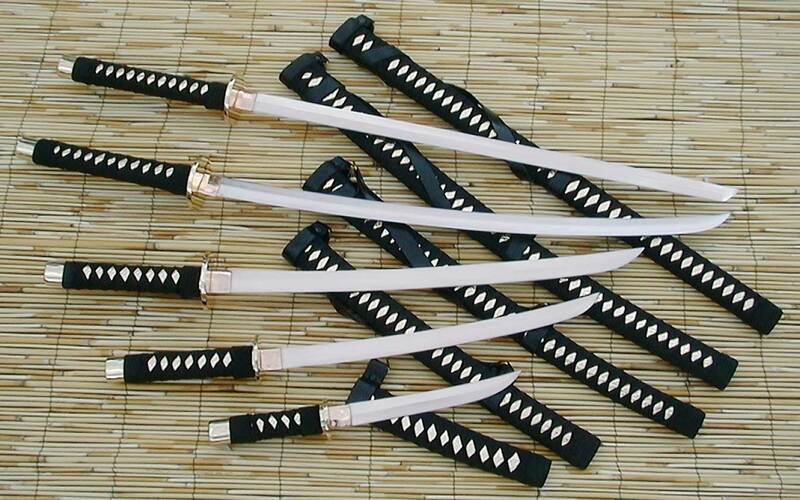 A very striking collection of swords at a unbelievable price point for the quality!